World Famous Car Festival of Lord Jagannath. See here the view of Bahuda Yatra (Return Journey) of Lord Bhalabhadra , Elder Brother of Lord Jagannath. The Name of Ratha (Car ) of Lord Balabhadra id Deva Dalan . Spreading over a total of 3479 sq. km. area, Puri is divided into eleven blocks. The district accommodates 15,02,682 people as per 2001 census. While the male population of the place is 7,63,389, the female population is 7,39,293. The district, with a total paddy area of 1, 70, 658 hectares, is primarily engaged in agricultural activities. Animal husbandry is another major occupation of the inhabitants of Puri. As the sacred land of temples, golden beaches and sanctuaries, Puri receives a huge number of global tourists every year who visit the famous Jagananth Temple, Chilka Lake, Sun Temple, among others. Astaranga: Astaranga is situated on the sea beach, 60kms from Puri. 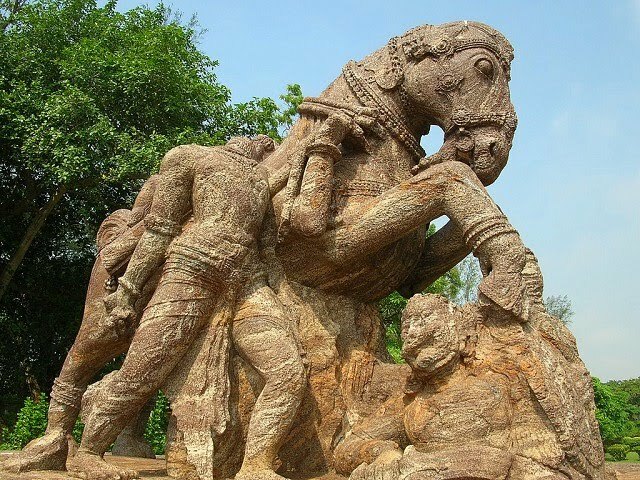 Kakatpur: 65kms from Bhubaneswar and is famous for Goddess Mangala Temple. This place is between Astaranga and Konark. Sakhigopal SakhiGopinath: The famous Sakhi Gopinath Temple is at Sakhigopal which will be about 12 K.M from Puri and its told without visiting Lord Gopinath after visiting Lord Jagannath is likely fruitless. 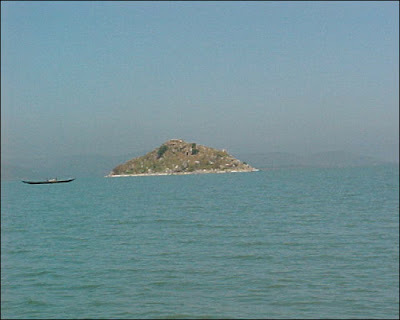 Satapada: The Famous for Entrance to Chilika Lake and View Dolphins attracting hundreds of visitors’ dailly during winter. 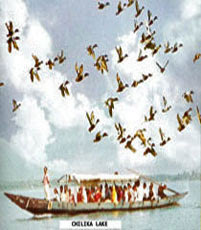 Bhubaneswar, Puri and Konark constitute the Golden Triangle of tourism in Orissa. The Konark is amoung them with the world famous Sun Temple. It is indeed an epic in stone. 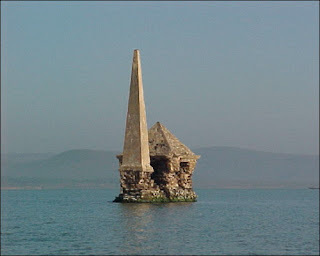 Today, this it is preserved like a wonderful gem as a monument of World Heritage. Konark is one of the Seven Wonders of the World. 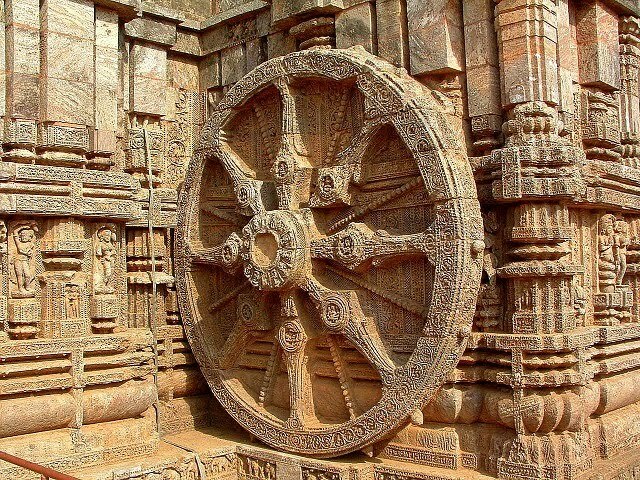 Konark (lat. 19.53'N; long. 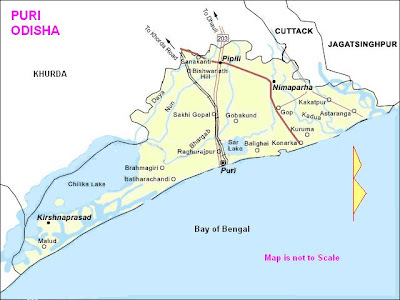 86.06'E) is a small town in Puri district. Sea beach of the Bay of Bengal is about 4 kilometer away. 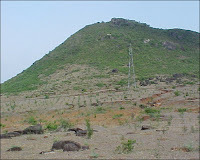 It is 70 km from Bhubaneswar in the direction of south-east. You can find the way in left at Pipili which is 15 Km away from Bhubaneswar on the road to Puri. The name Konark is derived from the word Kona+Arka=Konark, which means the Arka (Sun) of Kona (corner), the corner being that of Trikona or Triangle on the bank of the River Kushabhadra. Again it may be known from if that place is in any specific angle is being noted to that of the sun. To Visit Konark you can easily reach by road from either Bhubaneswar or Puri which are important stations on the East Coast Railway. You can find rented car or bus to visit from either place. The Orissa Tourism Development Corporation has provision of luxury coaches to Puri and Konark on a one-day conducted tour. 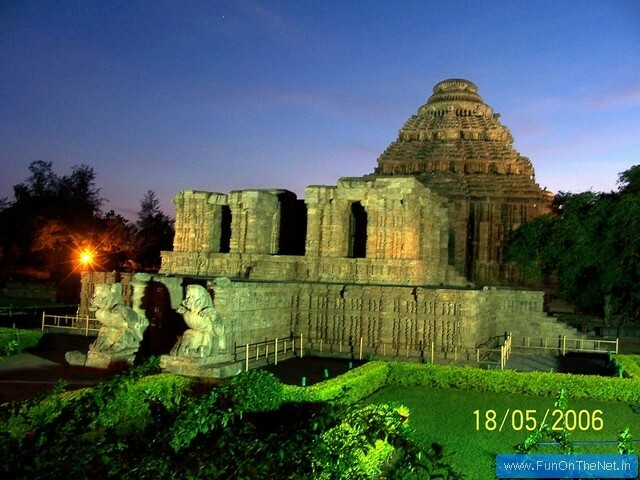 You can visit all the year round but October-March is the ideal time to visit Konark. It is said that the temple was built at a cost of twelve years' revenue. Twelve hundred workmen toiled twelve long years to complete it. There is again the fascinating story of a country boy, is a saga of courage and sacrifice of a 12 Year Old boy named Dharmapada or Dharama, the son of Bisu Maharana, the chief mason, who fixed the kalasa or Mundi (The Head of the Temple) at the top of the temple, Where all the workmen were failed to do so in despite of repeated attempts, but the spirited boy seeing his father Bisu Maharana, in agony, did the impossible feat at midnight. And for the shake of the humiliation of (Bara Saha Badhai) 1200 workmen he flung himself into the sea. So that it often called a phrage in colocal language that “Bara Saha Badhei re Dai kimba Pua re Dai” Either You are responsible for 1200 workmen of responsible for your son only?